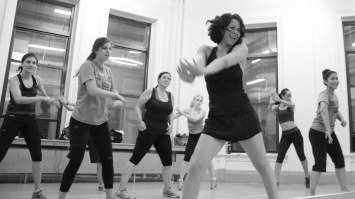 Zumba® exercise classes are "fitness-parties" that blend upbeat world rhythms with easy-to-follow choreography, for a total-body workout that feels like a celebration. Thanks to everyone who came to our summer event! Click here to see yours truly (navy blouse & white capris) doing Zumba on stage at the Katie Couric show!